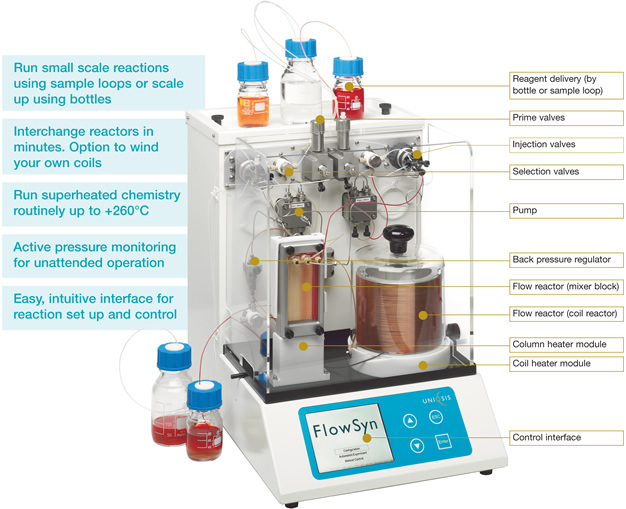 FlowSyn is a compact integrated continuous flow reactor designed for easy, safe and efficient operation. Two high pressure pumps deliver reagents, via a mixer, into electrically heated or cooled flow reactors. Back pressure regulators pressurise the system, allowing solvents to be superheated. Reaction outputs can be fractionated or optimised at steady state, after which the system automatically flushes itself ready for the next experiment. Uniqsis offers a comprehensive range of FlowSyn models and flowpath options (PEEK, PTFE, Stainless Steel and Hastelloy®) to cater for all major flow chemistry applications.